With the innovative, electronic measuring station seca 763, both the height and weight of a patient can be ascertained in just one step. After measuring and weighing, both values are indicated on two LCDs integrated into the display panel. SKU: seca_763. Categories: Medical, Seca. With the innovative, electronic measuring station seca 763, both the height and weight of a patient can be ascertained in just one step. After measuring and weighing, both values are indicated on two LCDs integrated into the display panel. On the basis of these values, the seca 763, at the touch of a button, automatically calculates the BMI of the patient. This value provides information on the general nutritional condition of the patient on the basis of the recognised WHO standard. 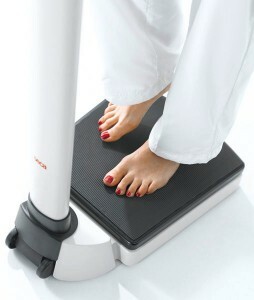 With its capacity of 250 kg, its low platform and very robust design, the measuring station is also extremely suitable for heavyweight patients.